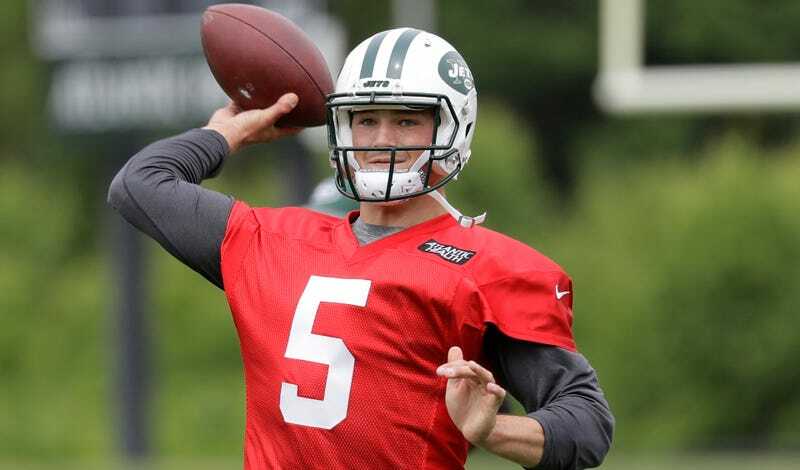 On Monday at Jets’ camp, Christian Hackenberg was having trouble just breaking the huddle correctly. During one rep in seven-on-seven drills, as he approached the line of scrimmage, a coach ordered him to re-huddle. When he broke the huddle again—in the wrong fashion for a second time—he was ordered off the field. No one expects the Jets to contend this season, but at some point, they will have to decide whether Hackenberg is the answer at quarterback, a decision that could affect their 2018 draft plans and their franchise for years to come. So for now, all eyes are on him. The next time Hackenberg took the field, he broke the huddle correctly and threaded a pass about 20 yards downfield for a completion. That kind of resilience will serve him well, if he wants to be the Jets’ long-term quarterback answer. The Jets drafted Christian Hackenberg in the second round a year ago.